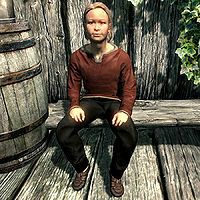 Frodnar is a Nord child who lives in Riverwood. He enjoys playing pranks on people and can sometimes be found talking to his friend Dorthe about pulling a prank. He is often accompanied by a dog named Stump as well. Frodnar: "Uncle Ralof! Can I see your axe? How many Imperials have you killed? Do you really know Ulfric Stormcloak?" Gerdur: "Hush, Frodnar. This is no time for your games." Frodnar: "Aw, mama, I want to stay and talk with Uncle Ralof!" Ralof: "Look at you, almost a grown man! Won't be long before you'll be joining the fight yourself." Gerdur: "Go and watch the south road. Come find us if you see any Imperial soldiers coming." Frodnar: "That's right! Don't worry, Uncle Ralof, I won't let those soldiers sneak up on you." Frodnar wears child's clothes and a pair of shoes, and is equipped with an iron dagger. He carries a key to the family's house, a selection of food and toys, and a small amount of gold. "You're new around here, so I'll go easy on ya, but don't get on my bad side." "Get me mad, and I'll prank ya. And not a little. A lot." "Ah, everybody around here's so serious." "So I like to have a little fun, so what." "My friend Dorthe doesn't like my pranking. "You're being mean, Frodnar!" So what if I am?" "Mother wants me to work at the mill, but I ain't nobody's slave." "You gotta have better things to do than talk to me all day..."
Dorthe: "Wait, so... a costume? You're not serious..."
Frodnar: "Sure I am. We get some furs and tree branches, paint them white, and then tie them to Stump. Instant Frostbite Spider!" Dorthe: "Frodnar... nobody is going to believe that your dog is a... Frostbite Spider. And if they do... they'll kill him. That's not much of a prank." Frodnar: "Oh yeah, and what would you rather do?" Dorthe: "How about... we play tag! You're it!" Frodnar: "Hey, no fair! Get her, Stump!" Hod "Hey boy, I heard you nailed a Septim into Lucan's doorstep. Damn near drove him crazy. That true?" "Tell me, son. Any truth to these stories I been hearing. About you gluing a cow's udders shut? You really do something like that?" "Heard me a rumor, boy. Something about you putting bugs in the stew over at the Sleeping Giant. You do this?" Frodnar "Sure I did. And I'd do it again." "Ha ha ha ha! Yeah, I sure did. It was one of my best pranks yet, father." Hod "Ha ha ha ha ha ha ha! That's my boy!" "Ha! I knew it! Had your name written all over it, that one did!" "See, now that's what I'm talking about. Working hard, making your mark on this world. Good job, son." Frodnar "He he he he he." "You just wait. My new pranks are going to the best ever! You'll see! He he he he." "Ha! That ain't nothing. Wait till you see what I got planned for next week." This page was last modified on 20 March 2014, at 02:48.